If music heals, then the young composer in charge of this musical nostrum should be awarded an honorary doctor's degree for his achievements in endorphin creation and antibody development. This would only be another accolade bestowed in his already impressive list of awards. 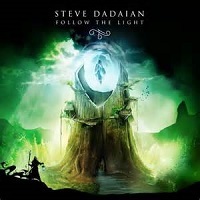 In case you have been living in a cave for the last few years, or you are just unaware, STEVE DADAIAN is a young guitarist taking the six string instrument by storm. Not only that, he's been busy winning some of the most important guitar contests out there and, oh yeah, he's also by releasing "FOLLOW THE LIGHT", which is a concept album. An instrumental concept album. That's a bold statement. "Beneath the Citadel" is the lively example of why Steve is where he is right now. It's a four minutes and forty five second track swarming with life and drive, that could very well uplift the gloomiest of spirits. Believe me, this record has a special ingredient that can be felt throughout all the songs. That special ingredient is the talent bestowed on this artist. This special talent creates a unique structure, that blends the past, present and future to become what we have now available now for our listening pleasure. This is a unique mixture of technique, talent, virtuosity and creativity all blended together with feeling and an innate ability to transmit the most important message that music can send; no matter how black the horizon, the sun will shine.Tracks like "Presence of Mind" seem to be a perfect soundtrack for such feeling, incorporating ethereal sounds to the already mystical approach of the base instruments. A motivator first and an outstanding artistic creator last, STEVE DADAIN may have never asked for it, but destiny has chosen him to be the next in line or to be the bearer of the torch. However you want to say it, because just as the prophecy foretells and just as every guitar hero has known. From Robert Johnson to Buckethead, there is no faster way to immortality than to be able to seemingly develop a third arm with six to twelve strings and an ability to express emotion through it without the need for words. "Follow The Light" has become a priceless addition to the vaults of the Metal Temple and a sign of light. Its a tireless effort, full of quality and substance for a generation that seems to be lacking a lot of inspiration and motivation these days. It's an honor to be witness to this, through thick and thin, just a few days before its initial release.